TS SPDCL to fill various category posts through Direct Recruitment: TS SPDCL to fill various category posts. The Telangana Energy Department have submitted proposals for creation of additional posts duly mentioning the requirement in the respective power utilities, in a phased manner. So, Government of Telangana has accorded sanction for creation of (2336) posts in various categories in the TS SPDCL power sector. Telangana Southern Power Distribution Company Limited(TS SPDCL): With a vision to fulfill the expectations of the Government, the Telangana Southern Power Distribution Company Limited, which came into being on 2nd June 2014, with an objective of electricity to the people at an affordable price. 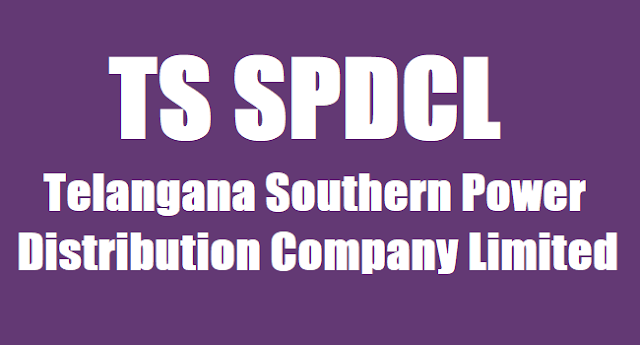 With its headquarters at Hyderabad, the TSSPDCL encompasses an area of five districts viz., Mahaboobnagar, Nalgonda, Medak and Rangareddy, Catering to the power requirements of 8 million consumers. ENERGY DEPARTMENT - Creation of (13357) posts in TS TRANSCO, TS GENCO, TS SPDCL and TS NPDCL - Orders - Issued. 1. From JMD, TS TRANSCO Letter NO.CGM (HRD)/MPP.1/306/Creation of new posts/2012, dated 30.01.2017. 2. Energy (HR) Department U.O.No.755/HR.A1/2015, dated 05.05.2017. 2. Accordingly, the Energy Department, in the reference read above, have submitted proposals for creation of additional posts duly mentioning the requirement in the respective power utilities, in a phased manner. 4. The Energy Department shall obtain concurrence of Finance (HRM) Department before initiating measures to fill up the posts sanctioned in this order, wherever service rules prescribe direct recruitment. 5. The expenditure on account of creation of the above posts shall be entirely borne by the respective companies by increasing internal efficiency and without leading to additional subsidy support from Government. 6. The Energy Department are requested to take necessary further action in the matter accordingly.